She's Back! Emilly Herrick returns to Corn Wagon! Plus pooky delights for haunting season! She's Ba-ack! 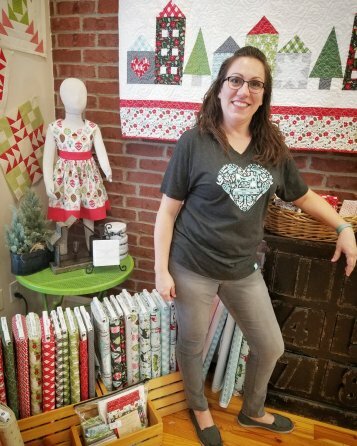 We are happy to welcome Emily Herrick back to the ranks here at Corn Wagon Quilt Co. I feel like we're welcoming her home after an adventure away. And in a way, we are. Emily is a long-time friend of the shop. Born in California, she has spent her married years here in Utah, raising three children with her husband, Gilbert. Many of you know her as a quilt designer under the name of Crazy Old Ladies. Her love of fabric and artistic talents have led through the creation of quilt patterns, books and eight fabric collections for Michael Miller Fabrics! You all remember her ocean inspired Shore Thing, bold yet woodsy Rustique and more recently, Sodalicious - - That's Emily! Her current collection, Rustique Winter is available here at the shop along with kits for her adorable My Hood quilt, all shown below. Emily's creative mind is always thinking up new and innovative ways to approach quilting. The energy she brings to the shop is so much fun! We were sad to see her go a few months back as she took a break from quilting to try something new. But as we all know, once quilt-making has a hold on you, it's impossible to resist! She's back and she's eager to see all her quilty friends again. Whether you need her help deciphering a pattern, advice on creating your own color story or just want to say hello, stop in and enjoy the fabric with Emily! How cute are these?! Spooky delights ready to stitch up for haunting season. Instructions for 6 Little Halloween Pillows are included in this new pattern by Bareroots. 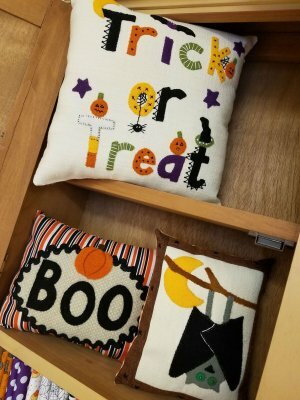 You'll find wool applique, embroidery and a fun chance for some creative embellishing in these Halloween themed pillows made by Marianne Michaels. They would be a perfect project to bring to our It's All About Wool Club meeting Tuesday, October 9th, 1:00-3:00 p.m. in our classroom. See our class list on our website for more details. Hey there, Pumpkin! Our entry is currently full of them; whether they be wooly or cotton, pieced or appliqued, orange, green, white or even smiling back at you, the pumpkins are plentiful here at the Corn Wagon. 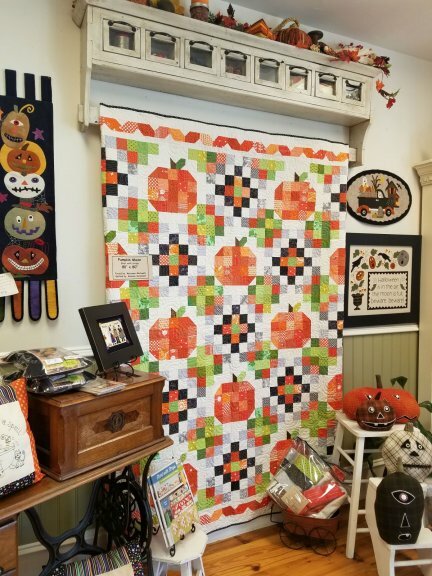 The Pumpkin Maze quilt shown here was pieced by Marainne Michaels and machine quilted by Ramona Sorensen. 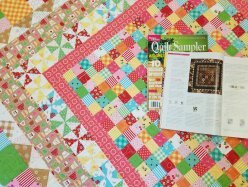 It's one of 13 fabulous quilts in the Start with Strips book by Susan Ache. Kits for this and other pumpkin projects shown here are available now in-store. Saturday, October 6th - - 9:00 a.m. - 5:00 p.m. It's time for our third month of Saturday Sampler! Doors open at 9:00 a.m. for those registered for this mystery block-of-the-month. Demos begin at 9:15 and repeat every 30 minutes. Last demo begins at 12:45. Don't forget to bring last month's finished blocks into the shop with you so you can pick up this month's blocks free! Monday, October 1st - 25% off MODA PRECUTS! Friday, October 12th - - 10:00 a.m. - 4:00 p.m.
A fresh take on a Corn Wagon classic! In 2003 our shop was published as one of Better Homes & Gardens Top 10 Quilt Shops. Little Prairie Houses, the quilt featured as our shop pattern in that magazine issue, was designed by Mary Jacobsen to celebrate Utah’s heritage. To mark 15 years since receiving that honor, Mary has revisited that popular pattern using a fresh new color palette. Now you can learn from Mary the techniques she used to piece those cute little houses surrounding a scrappy field of nine-patches fenced in by pinwheel blocks. Join us for this great skill building class and experience a traditional piece of quilt shop history in a new way. 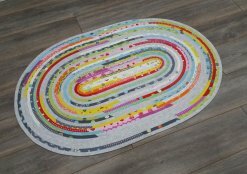 Saturday, October 13th - - 10:00 a.m. - 1:00 p.m.
Roma Lambson, designer of the Jelly Roll Rug will be coming to Corn Wagon! We can’t wait to learn her technique for sewing up those adorable 30” x 44” rugs using a jelly roll and cotton batting strips. Some prep before class means you will have the chance to finish your rug with Roma’s help in class. Only a few seats left so don’t wait to sign up!